Top Attractions for Automotive lovers in UAE - Muscle Cars Zone! UAE has always been on the wishlist of thousands of travelers around the world. UAE offers one of the best luxurious experiences to its travelers and always keeps on introducing new attractions to enhance that experience. Let`s face it, you can never be wrong on choosing Dubai or any other Gulf state as your travel destination. We are quite sure that many of you share the similar opinion. No matter what type of person you are and what is your passion about? You will always be able to find something meant for you in UAE. Well, today in this article, we are going to specifically talk about the automotive lovers, people who share a passion about speed, performance and cars, and bikes. To be honest, we don`t think that you will be surprised to hear that UAE has some great spots just for the type of people we are talking about, Right? Throughout this article, we will mention the top places to go to if you have a passion for cars. No matter whether you have a love for vintage beauty or if you crave to experience the raw power of modern supercars, you will not be disappointed at the places we have mentioned below. So, grab a cup of coffee and start reading this article until the end to find out about the best places to visit in UAE if you are an Automotive lover. 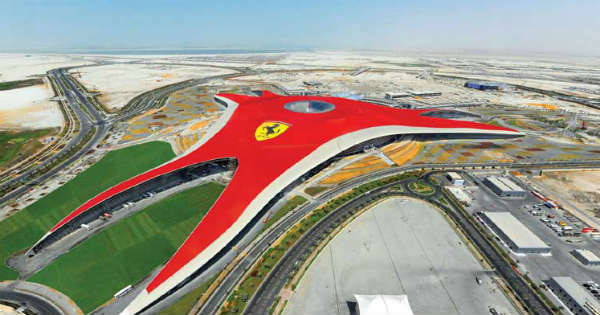 There`s a good reason that we kept Ferrari world at the top of this list. It is one of the unique places that not only caters to the passion of car lovers and Ferrari lovers but also satisfies the hunger of T-type people. It is a Ferrari themed indoor amusement park. It has rides themed around the cars of Ferrari and its iconic Red color. 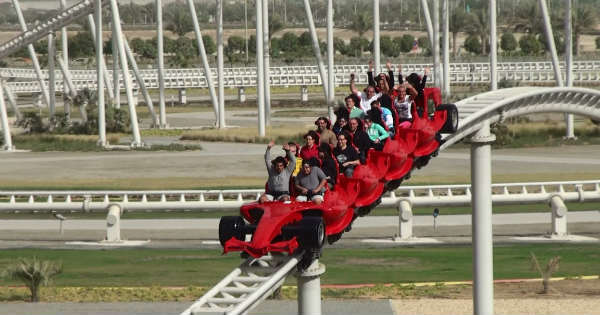 There are exciting and thrilling rides and yes, this amusement park also houses what is called as `The Formula Rossa`; a ride that reaches an acceleration of 240 km/hr in less than five seconds. Honestly, can you believe it? Well, UAE has a lot of wonders and this has to be one of them. Now, just answer one question, “Don`t you think that has to be something more at Ferrari world than just rides, although rides themselves are mind-blowing?” if your answer is yes, then you truly have a passion for cars. How can you not talk about driving a Ferrari at Ferrari world? Well, you can get the experience of driving a Ferrari on a simulated track themed on the Yas Marina circuit. Although simulated driving is not as much fun as the real deal you don`t have to worry about the car insurance Dubai this way. This circuit is the venue for annual F1 Grand Prix. Watching a real formula one race is fun for everyone but we are not talking about everyone here, Right? We are talking about the ones who have a passion for raw automotive power. Well, when a race is not taking place here, automotive lovers can come here and drive the formula one beast cars and feel the raw performance themselves. And if you don`t want to try your hands on one of the cars, then a lot of events are organized every year here besides the Formula 1 Grand Prix like TRD 86 cup, Ferrari Asia Pacific challenge, Yas racing series and Super Street challenge. Just like Yas Marina Circuit, Dubai Autodrome is also a great attraction for you if you want to try your hands on a racecar for the first time. Not only this, popular race events like formula 3 and formula 4 also take here. Above all this, the prices for getting a self-drive experience here are also very nominal. Racecar drive experience is available for both indoor and outdoor activities. Just a helpful tip, don`t forget to read the conditions for car insurance Dubai Autodrome in case you happen to mess up your drive experience. There is a great variety of different types of car lovers. On one hand. There are those who want to drive every type of car and on the other hand, there are those who admire the beauty of classics and vintage cars. They don`t want to drive, they just want to have a glimpse of it, be amazed by its beauty and capture it in their eyes. Well, Sharjah Classic Car Museum is the heaven for the latter type of car lovers. It contains a collection of more than 100 classic vintage cars each of which has a great history attached to them. They have cars from as early as 1917 too. You can even find vintage bikes and bicycles at this venue. If you truly crave to admire the beauty of revolutionary classic technology, then you should visit this museum in Sharjah. You will come across powerful engines and other parts of a car from companies like Rolls Royce and Bentley. Many countries across the world host international car shows and auto expos. But, let`s face it, Dubai is not just another country and so is not it`s international car show. Cars of almost all of the top car manufacturers around the world can be found at this show. During your visit to this show, believe it, you will not be wanting for anything more. Supercars, classic and vintage cars, Race cars, exotic cars everything can be found here. Even if you have to reschedule your visit to UAE in order to visit this show, then trust us, it will be totally worth it. Usually, this show takes place during the month of November every year but you would be better off if you double check the dates yourself. Emirates National Auto Museum was built to display the car collection of Sheikh Hamad Bin Hamad Al Nahyan. Quite a long name isn`t it? This museum houses more than 200 cars and each one of these two hundred cars carries its own story. From American muscle cars to vintage, from sports cars to monster truck, you can find some of the most exotic cars around here. Some of the top attractions of this museum include the classic collection of Mercedes cars if sheik and vintage cars from as early as the 1920s along with vehicles inspired by military designs. You might be surprised to know that we haven`t mentioned the greatest attraction of this place yet and to add to your suspense, that attraction is not even a car. The Emirates national auto museum houses the world`s largest truck. To give you an idea of its size, imagine a truck under which you can easily park multiple cars. Not everywhere in the world, you are able to witness a parade of supercars and vintage cars. But as we mentioned earlier, Dubai is not just another country, there`s a reason it ranked amongst the top international tourist destinations. Dubai Grand parade takes place at the Motor Village in Emirates. It is popular for showcasing some of the fastest and luxurious cars from all over the world. You not only find the exotic cars in this parade, you also come across the fleet of fast motorbikes. The parade runs through popular tourist destinations of Dubai. There are a lot of entertainment shows and activates also going on along with the parade. If you still find this parade unattractive to hear about, then you should know that this parade has set multiple Guinness World Records in the past too. This is another attraction for those who want to witness and get awestruck by the beauty of vintage and luxurious rides. You can even find iconic cars like corvette stingrays and some of the vintage Bentleys and Rolls Royce. This car festival is hosted by the collaborative efforts of Emaar properties and Automobile and Touring Club of UAE and is held at the downtown area. The participants of this festival can be anyone who owns a car from the pre-1986 era. Well, keeping all the glory of this car festival aside, can you answer how the car owners of this festival are able to get insurance in Dubai for these cars from history? Okay, keeping the jokes aside, believe it, you will not be disappointed in a car show like this even if you don`t like cars at all. So, we talked about a lot of attractions for an automotive lover in UAE. Each of these places or show will offer you an experience different from others. But, one thing that will be common at all these places experience wise is that you will be left awestruck at each one of these destinations. One thing we would like to mention again is that do not forget to read all the terms and condition when you go for a driving experience like car insurance Dubai Autodrome etc. in the end, we hope that you enjoyed this article and learned something new about UAE.